January | 2014 | 50 Westerns From The 50s. Tennessee’s Partner At The Iverson Movie Ranch. 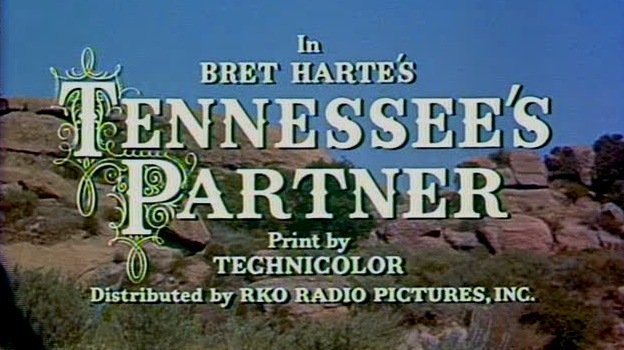 I really love Allan Dwan’s Tennessee’s Partner (1955). I’ve always enjoyed Dennis’s blog dedicated to the Iverson Movie Ranch. It’s a frequent stop for me. Earlier this month, he posted some stuff on Tennessee’s Partner (1955) and its extensive use of the Iverson Ranch. 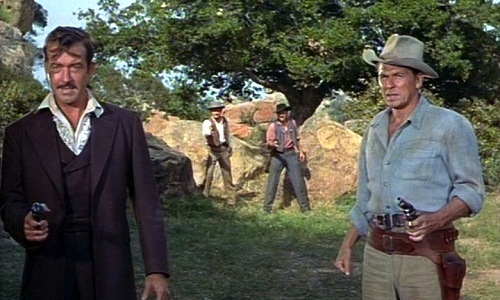 Cinematographer John Alton did a masterful job on this one, and I doubt the ranch ever looked better than it did here. If you’re new to this blog, be prepared to lose an hour or two or three. 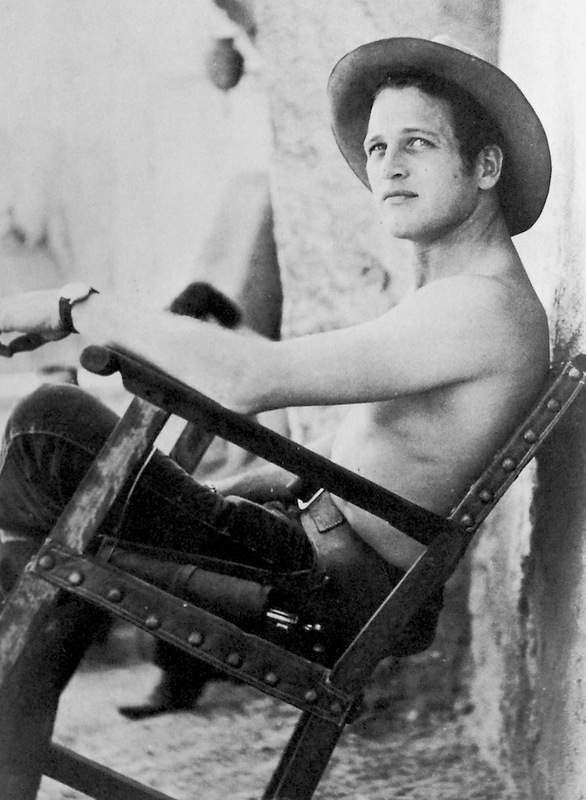 Anthony Mann Goes To UCLA. Another day, another reason I’m living on the wrong end of the country. UCLA will present a very thorough Anthony Mann retrospective, covering all the noir and Westerns we know and love, at the Billy Wilder Theater starting this week. Click on Gary Cooper for details. 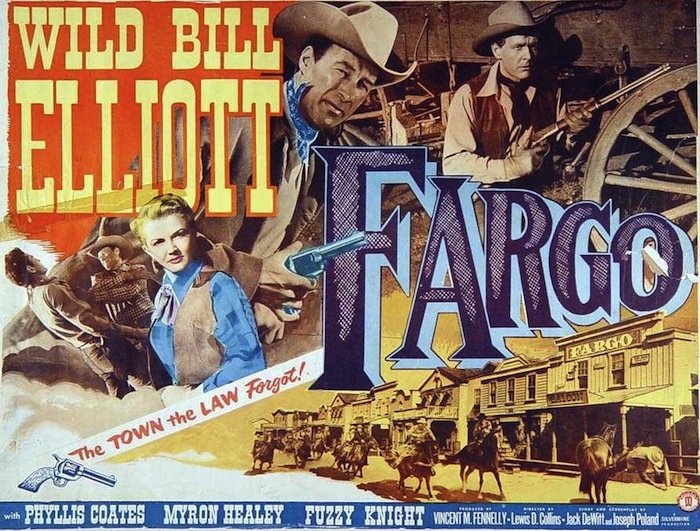 CAST: Bill Elliott (Bill Martin), Myron Healey (Red Olson), Phyllis Coates (Kathy MacKenzie), Fuzzy Knight (Ted Sloan), Arthur Space (Austin), Jack Ingram (Rancher MacKenzie), Robert Wilke (Link), Terry Frost (Alvord), Robert Bray (Ed Murdock), Denver Pyle (Carey), Tim Ryan (Sam), Florence Lake (Maggie), Stanley Andrews (Judge Bruce), Richard Reeves (Bartender), Eugene Roth (Blacksmith). The last of the Elliotts to bear the Monogram logo, Fargo tosses a few curveballs into the usual ranchers vs. settlers tale. Bill Martin (Elliott) rides into Fargo to settle his brother’s estate and ends up trying to carry on his brother’s work — advocating the use of barbed wire to fence off the range. A gang of thugs, lead by Red Olson (Healy) are determined to keep the range undivided. 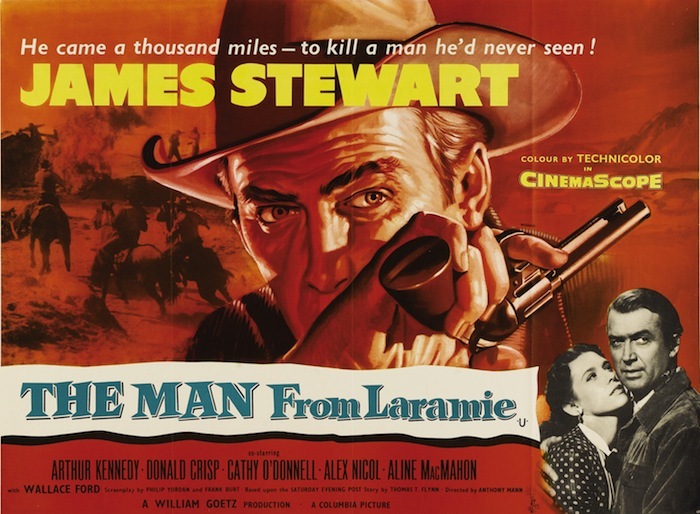 There’s a tough, adult spin on the usual B Western here, typical of series Westerns from this period. For instance, an early saloon brawl is particularly brutal, and the badguys do something to Elliott about halfway through that’ll make the hair stand up on the back of your neck. (No spoilers here, folks.) And there’s a Rube Goldberg-ish barbed wire machine that I found fascinating. 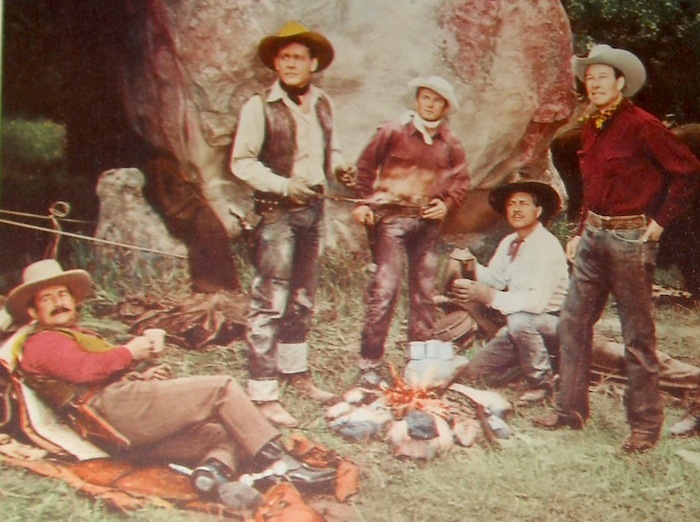 One of the real joys of 50s Westerns is the cast, and here we get the chance to spend time with folks like Elliott, Phyllis Coates, Fuzzy Knight, Jack Ingram, Denver Pyle and Robert Wilke. Of course, Myron Healey is every bit as despicable as you’d hope. But what I really appreciated about Fargo was its excellent use of the Iverson Ranch. Many of the familiar rock formations we know and love pop up over the course of its 69 minutes. Warner Archive makes sure Fargo looks good, not eye-popping, but far better than you’d expect a Monogram cowboy movie to look in 2014. Originally released in sepia tone, we get it black and white, which is fine. The audio’s strong. Judging from the comments that have come in about these Elliott pictures, I’m not the only one happy with this twin-bill DVD — and I’m not alone in wanting the rest of the series. It’s hard to wrap my head around the fact that Paul Newman isn’t with us anymore. The world’s a lot less cool without him. Who else would put a supercharged Ford V-8 in a Volvo station wagon? Newman’s seen above on the set of Arthur Penn’s Left Handed Gun (1958), a 50s Western I consider great in spots, kinda crummy in others. 50s Westerns (Related) DVD News #143: The Bill Elliott Detective Mysteries. This is a big one, folks. After making his B Western, The Forty-Niners (1954), for Allied Artists, William Elliott ended his Hollywood career with five tough little crime pictures for the same studio, released 1955-57. After playing Detective Lieutenant Andy Flynn of the Los Angeles County Sheriff’s Department in the first one, Dial Red “O” (1955), he became Andy Doyle in the other four. The Bill Elliott Detective Mysteries from Warner Archive presents all five films in 16×9 widescreen. Most run about an hour — and have been on the Want Lists of “Wild Bill” Elliott fans for ages. They’ll be on the Warner Archive lineup on Tuesday. Dial Red “O” (1955) An unhinged vet triggers a citywide manhunt when his soon-to-be-ex-wife gets bumped off. With Paul Picerni and Sam Peckinpah (uncredited as a cook). 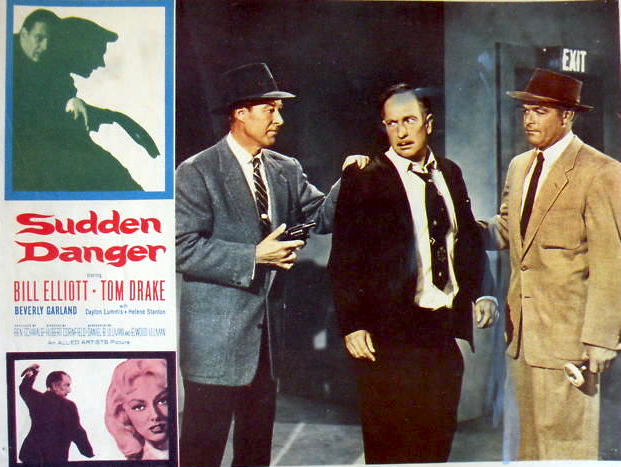 Sudden Danger (1955) Elliott investigates a suspicious suicide — and the prime suspect turns out to be a blind man. 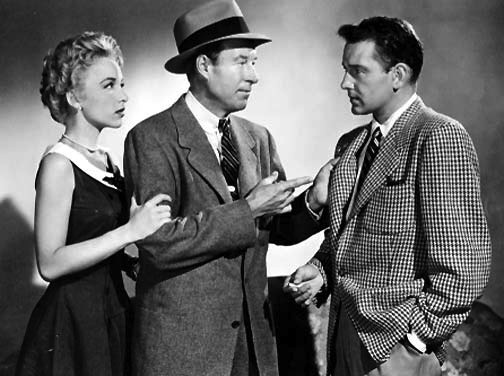 With Beverly Garland and Lyle Talbot. 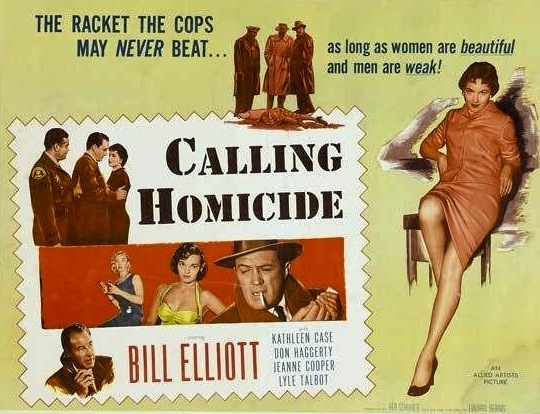 Calling Homicide (1956) Elliott connects the dots between a cop-killing and a model’s murder. With Don Haggerty (who’d appear in the rest of the series), Lyle Talbot and James Best. Chain of Evidence (1957) A reform school grad is accused of murder. With Haggerty, Timothy Carey and Dabbs Greer. Footsteps In The Night (1957) A high-stakes poker game ends in murder. Directed by Jean Yarbrough. Daniel B. and Elwood Ullman, who wrote several of Elliott’s Monogram Westerns, are on hand for these films, and they make the transition from the Old West to the City Of Angels with ease. You might be interested in these as a curio more than anything else, but they’re cool little movies and Elliott is as terrific as ever. Highly recommended. 50s Westerns DVD News #142: Monogram Cowboy Collection, Vol. 7. Three Monogram cowboys ride tall in the latest volume of Warner Archive’s Monogram Cowboy Collection. This time, some of the films creep into the 50s. As we all know, the B Western was in its last days. 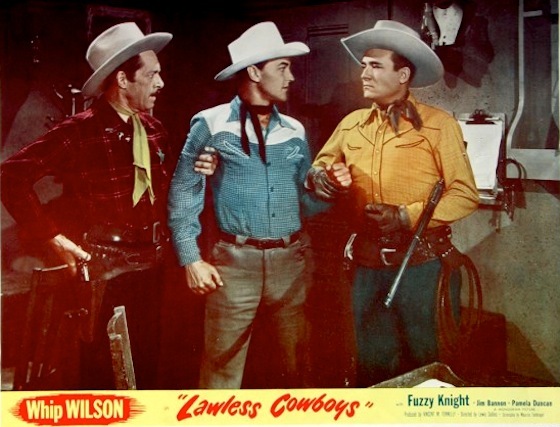 Gunslingers (1950), Silver Raiders (1950), Arizona Territory (1950) and Lawless Cowboys (1951). Happy birthday to my favorite cowboy star, Randolph Scott. 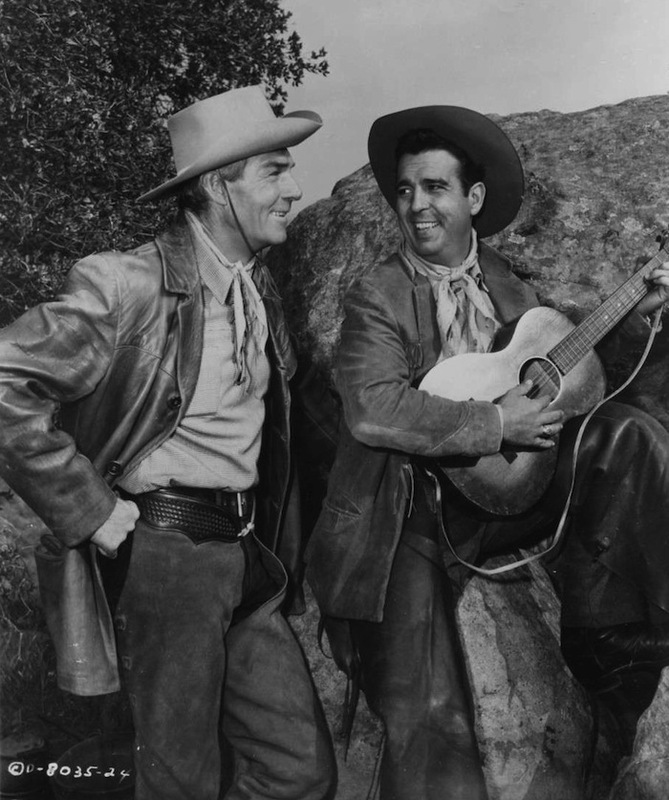 He’s seen above in Man In The Saddle (1951), hanging out with Tennessee Ernie Ford. This is an excellent Scott picture, which you can read all about in a recent post over at Riding The High Country. Or you can stick close to home with A Lawless Street (1955) here.